How to add quantities on product payments? I was creating a quick sample form for selling products through Paypal on your website. I noticed that you can offer multiple products but I could not see how to offer higher quantities of each product other than 1. Is this possible? For example, I have a child ticket and an adult ticket. A customer needs 4 adult tickets and 3 child tickets. Can this be done? Thanks for contacting us. You need add an option for quantities to be able to achieve that as shown on the image below. 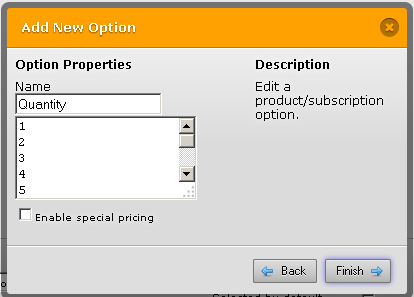 Click "Add New Option" and another window should popup where you can set a Quantity property. This lets users to multiply the base price according to the quantity needed. You may also tick the "Custom Property" box to let your user to enter any quantity number rather than choosing predefined quantities. If you plan to set a predefined quantity and not custom, this the next page you will see. You will set your predefined quantity here. You may also check the "Special Pricing" to set a specific pricing for each quantity.